© Studio Remco van Bladel, Scale model #4, Amsterdam 2014. With Artists of Rojava, Artists Association of Azawad (Mazou Ibrahim Touré & Moussa Ag Assarid),Center for Political Beauty (Fabian Eggers, John Kurtz & André Leipold), Chto Delat (Dmitry Vilensky),Concerned Artists of the Philippines (Lisa Ito), Forensic Architecture (Lorenzo Pezzani), Grupo Etcétera(Federico Zukerfeld & Loreto Garín), HudRada (Lada Nakonechna), Gulf Labor (Natascha Sadr Haghighian), Haben und Brauchen (Ina Wudtke & Inga Zimprich), Immigrant Movement International(Tania Bruguera), Institute for Human Activities (Renzo Martens), International Institute of Political Murder (Milo Rau), Jewish Renaissance Movement in Poland (Yael Bartana & Susanne Sachsse), PAF – Performing Arts Forum (Jan Ritsema), Office for Anti-Propaganda (Marina Naprushkina), Schoon Genoeg! (Matthijs de Bruijne), The Laboratory for Insurrectionary Imagination (John Jordan), The Silent University (Emily Fahlén & Ahmet Öğüt), WochenKlausur (Hannah Rosa Öllinger & Manfred Rainer) et al. 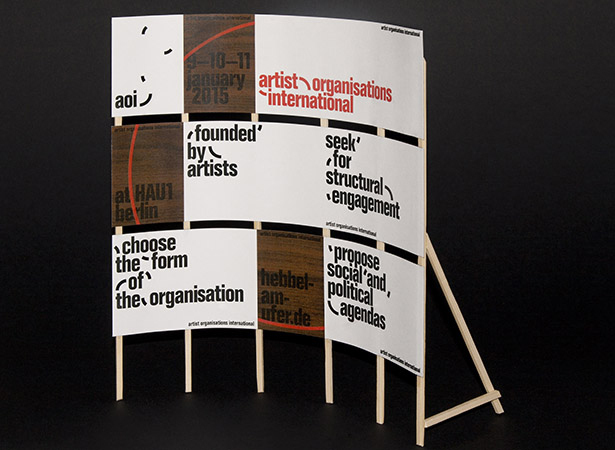 Artist Organisations International (AOI) brings together over 20 organizations, founded by artists, confronting the current crises in politics, economy, education, immigration and ecology. Artist Organisations International explores the current shift from temporary, precarious art projects to long-term structures of engagement built by artists. Which specific artistic values and political potential do such organizations have? How do they perform? And what could their concrete impact be in various political and social agendas? The economic crises, the global erosion of civil rights and the massive rise of social movements have demanded new models of structural participation from politically engaged artists. The shift from the working model of the project to that of the organisation no longer reduces artistic engagement to the singular figure of the author and expands its scope and influence—for example by seeking larger alliances with or creating new forms of educational and community structures, non-parliamentary groups, liberation movements, unions or even political parties. While some artists primarily use the concept of an organisation or institution as an artistic form (or perhaps as a metaphor) which serves their artistic vision most properly, for others organisational structures are the necessary means to realize specific political objectives. The invited artist organisations operate as actual organizations—and at the same time they are often works of art themselves or use the possibilities of an artwork by stressing categories such as visual literacy of re-presentation and transformation. They all connect—with different emphasis—symbolic practice and structural effect. Working collectively has become the paradigm of artistic practice in the last decade. Choosing the form of an organisation is an expression of the longing for more sustainability and resilience, while on the other hand it maintains the performative notion of change and subversion: artist organizations are living organisms that permanently challenge power. Artist Organisations International introduces an array of those strategies as modes of resistance, emancipation and (self-)governance. By seeking new alliances Artist Organisations International aims to contribute to the strengthening of ties and collaboration between different artist organisations worldwide.